Philip Grosss latest poetry collections are The Water Table (Bloodaxe, 2009) winner of the T.S.Eliot Prize and I Spy Pinhole Eye, with photographer Simon Denison (Cinnamon, 2009), which won Wales Book of the Year. He has published ten teenage novels - most recently The Storm Garden (OUP). 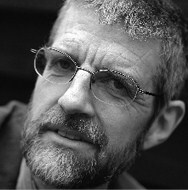 His books of childrens poetry include The All-Nite Caf which won the Signal Award, with a new collection Off Road To Everywhere (Salt, 2010 - a Children's Poetry Bookshelf Choice). Since 2004, he has been Professor of Creative Writing at Glamorgan University, South Wales, UK, where he leads the M Phil in Writing programme. in the bombed-out network of the ninety year old brain. reach for the tablets if you will. We are inside already.